This message in a bottle beach wedding invitation is so cute! Perfect for a beach themed or destination wedding in the tropics. It’s light hearted and whimsical and features clam shells, starfish, and sand dollars! The colors are very soft. I look at it and want to be on that beach! You can also use this for a beach themed wedding. You can change the text to make this an invitation for any other special occasion as well, so it can become a bridal shower invitation too. All the text is customizable on these products and they come with standard white envelopes. You can also choose from a variety of paper types. You can see the whole design range here at Starzraven’s store on Zazzle. 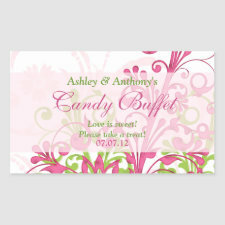 There is a RSVP and thank you card available for purchase that matches the invitation (shown below). If you want additional matching items to go with the design, Starzraven can add them for you. Starzraven also has a similar design with pink flowers. This design has a variety of matching stationery items to go with it as well. Geek is now the new chic. Geek chic embraces stereotypical geeky characteristics such as glasses, computers & electronics, gaming, comics and a love of sci-fi. Plus, you can browse the internet and find some really great examples of geek chic wedding ideas. This article from Bridal Musings is particularly thorough in providing some great geek wedding inspiration. Of course, you’re going to need some geek themed wedding invitations or save the date announcements to go with your geek themed wedding. You can make them yourself of course, but Dynamic Weddings on Zazzle has a great selection of fun geek chic wedding designs. We’ve only featured a few on this page. 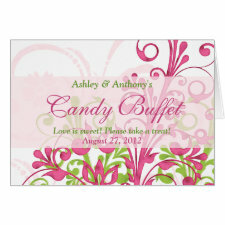 Candy buffets are very popular with weddings and bridal showers these days. The idea is to stock a table with candy treats and then provide the guests with little baggies or boxes so that guests can pick and choose which goodies they want to take home with them. Or, you can pre-package up some goody bags or candy bouquets (lollipops) for guests as well. This article from Project Wedding provides some great advice for creating the perfect candy buffet. 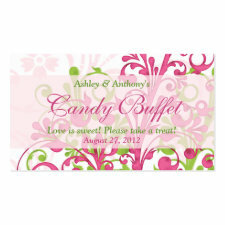 Here are some examples of stationery products you can use to personalize your candy buffet. These would work well if you’re having a wedding with a pink and green theme. The sign can introduce your guests to the table. 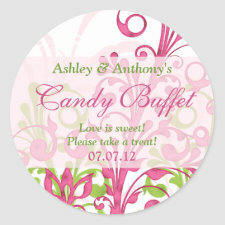 The little round stickers can be put on bags or boxes for your guests to fill. The larger rectangular stickers can be wrapped around jars. Finally, the gift tags, combined with a ribbon, can be used for pre-packaged take home goody bags.